Katey and I have been looking at campers on and off for about two years now. We’ve looked primarily at popups (aka folding tent camper) and hybrids (hard sides with foldout tent covered beds) and we prefer ones that have a slide out dinnette to increase the interior space. Over the recent Labor Day weekend we looked at several new models and a pair of lightly used popups. The sellers of both used popups were quite nice and friendly. They showed us how popups are setup and taken down, as well as all the amenities and features. It was quite informative. In the end we decided to purchase a 2015 Flagstaff HW27KS popup from a nice couple who lived down in Tyrone, GA. The sellers nicely brought the popup to our part of town (~50mi drive) and then came home with us to make sure that we went over the setup procedure again, which was very nice and thoughtful of them. At present we are inventorying our existing camping supplies and gear and preparing for getting everything stored neatly in its place. 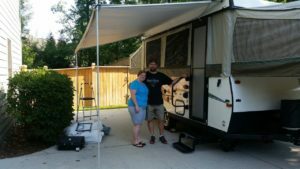 There are a few “things” I want to add to the camper, but overall the camper is in great shape and is practically ready to go camping immediately. Below are some of the pictures of our new camper.